The Bravado Dream Nursing Tank provides full-length style and full-time support at home or on-the-go, whether you’re pregnant or nursing. Built-in, molded, double layer cotton full support nursing bra with removable foam inserts for discretion and shape. You can opt to wear it alone with your favorite jeans, or under a sweater with a cozy pair of leggings. Cups unclip at the shoulder and fold down and away from your body to give baby full skin-to-skin contact which is essential to help establish a breastfeeding rhythm. Sizes 34-40; B/C, D/E, F/G. The Support of a Bra in a Beautiful Tank! 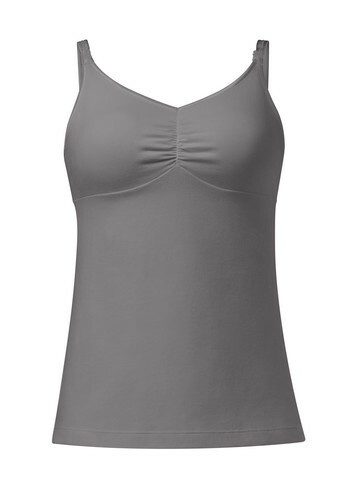 The Bravado Dream Nursing Tank is great! I love how soft it is (92% cotton) and how convenient it is (you don't need a separate bra for this top). The insert for the cups is thin but definitely provides enough shape and coverage to prevent "headlights." Before pregnancy I was a 32B~34A depending on the brand and now in my 8th month I'm hovering around 36B/C~38B. Their size 36B/C fits me well. The clips are very easy to undo and do back up. I liked this top enough to get it in all three colors and highly recommend it!